Cam's Cinematic Episodes: Film Review - ASHES OF TIME REDUX: Kung Fu Dreamer. 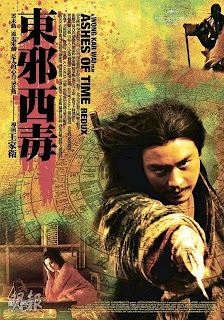 Film Review - ASHES OF TIME REDUX: Kung Fu Dreamer. Once in a blue moon, I find myself watching a movie that leaves me at a loss for words. Well, almost anyways. 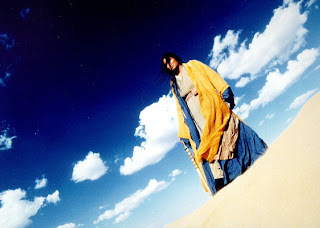 Wong Kar Wai's Ashes of Time Redux (aka Dung che sai duk redux) falls into that category, a narrative jumble of eye-popping imagery and subtle emotions that persistently challenges the viewer to find any sense of coherent story within it. Honestly, this is a film that would require flow-charts and an assemblage of a dozen esteemed film and literary scholars to properly decode into a comprehensive whole. With that said, though, it's something of a Herculean feat on Wong's part that this trancelike head-trip is still a thoroughly fulfilling and transporting visual journey. It's actually kind of amazing that Ashes of Time managed to hold together at all. Originally released in Asia in 1994, the film was a critically lauded disappointment, m aking back but a fraction of its sizable budget. However, as is sporadically the case, the film began to accumulate a supportive fan-base who recognized the art within Wong's fever-dream madness. This support led to multiple edits, official and unofficial, each seeking to properly refine the essence of what the film was trying to say. Recognizing an opportunity to reach a wider audience, Wong then set out to restore his fi lm for a big screen revival, only to find that his original prints had been all but destroyed by the studio's print lab. After years of scouring black-markets and studio archives for alternate takes, digitally heightening their colour grades and recording a new soundtrack with famed cellist Yo Yo Mah, Wong and his editors are now finally introducing North American audiences to their definitive version of the film, appropriately labelled Ashes of Time Redux. Loosely based on Louis Cha's novel The Eagle-Shooting Heroes, Ashes of Time Redux transports us to a lonely desert inn run by the sombre Ouyang Feng (the late Leslie Cheung), a heartbroken assassin who outsources his contracts to other hired guns, er swords. Over the course of the film, which is broken into six parts – with each representing one of the Chinese seasons - we come to know the men and women who enter his solitary life. 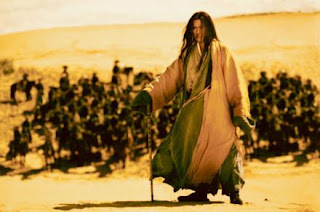 Some of the more memorable guests are Hong Qi (Jacky Cheung), a skilled and ruthless killer shadowed by his blindly loving wife (Li Bai), Bridgitte Lin as a woman scarred by emotional pain who has created two separate identities in which to strike back at her uncaring world, and the mysterious Blind Swordsman (Tony Leung Chiu Wai), a once-great warrior who yearns to return to his lost love before his sight degenerates completely. Wong uses these characters in an abstract fashion, like emotional brushstrokes on a canvas, to explore his desired themes regarding the overpowering nature of man's memory over his life, as well as how our pasts can disrupt identity and affect our ability to connect with our fellow man. 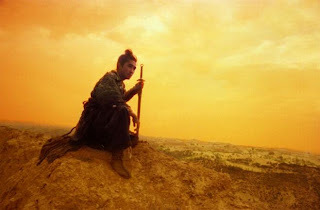 Ashes of Time Redux is an unabashedly romantic film in the purest sense of the word, lyrical, sensual and haunting, an unflinching glimpse into the human soul. But the real backbone of the film, and what makes it a rewarding trip, are the stunning images that Wong a nd cinematographer Christopher Doyle produce with their lenses. 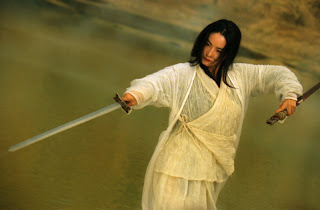 We see a woman, standing in an oasis-like lake, wielding a sword, who, with each slice and thrust, produces momentous bursts of water that surge upwards, reaching out to an expansive blue sky. As well, warm sunlight light filtered through a birdcage casts foreboding shadows across the human characters, stressing their own personal imprisonment. And my own favourite: a meditative shot of a dying warrior gazing calmly heavenward, while blood flows elegantly from a fatal throat wound. 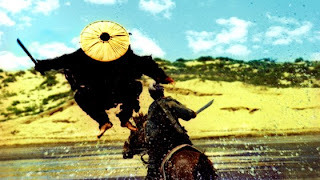 This is a beautiful movie, even in its ugly and indistinctly staged fight scenes, which manages to communicate more with images than through its characters' poetic monologues. It's a martial arts film by way of David Lynchian dream-logic, a fractured memory that aims to draw the viewer into a sensation, as opposed to a story. When the closing credits come up, we aren't left with a feeling of completion, but rather the sense of waking from a particularly surreal reverie. Ultimately, however, I do realize that Ashes of Time Redux is probably destined to infuriate more attendees than it will inspire. So, this is where my job as a reviewer ends, and your role as a consumer kicks in: if you are an adventurous film-goe r, who craves non-linear storytelling and extraordinary images, I heartily recommend tracking this film down. You'll be dazzled, frustrated, intrigued and spellbound by the ambitious tapestry that Wong Kar Wai has woven. Memory may be the root of man's troubles, but Ashes of Time Redux proves that it can also be the source of endless visionary wonders.